Suspended over the busy streets of San Francisco are the lights of Shimmer. Consisting of 31 Icicles and 4,464 LEDs, colorful illuminated pattern flow through the sculpture. Each Icicle is coated in a Dichroic coating that will filter the emmitted light (and reflected light during the day) based on the position of their view and changes its color dramatically in different perspectives. 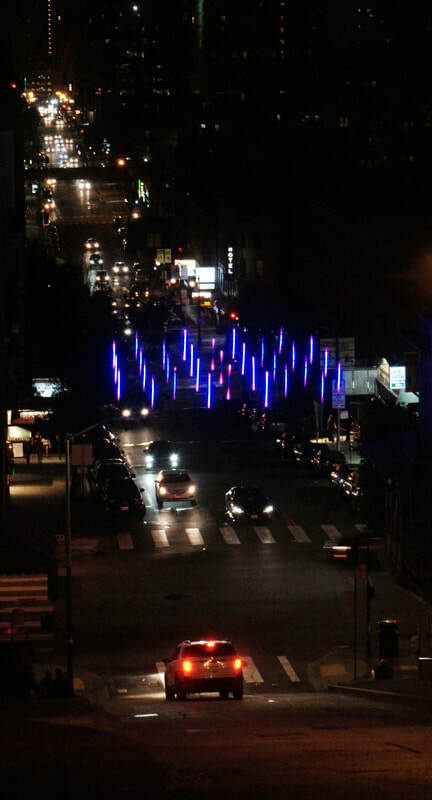 Shimmer is currently on display at the intersection of Kearny and Broadway in the historic North Beach neighborhood famous for it's neon lighting.